At Google I/O today, Sundar Pichai specifically discussed security innovations happening on Android as it builds an open platform that innovates quickly. Pichai used this as an example to jab at Apple’s iOS 8 for only now introducing alternative keyboard and widgets as Android has had the features for years. Pichai said that “less than half a percent of users” ever experience any issue with malware on Android. 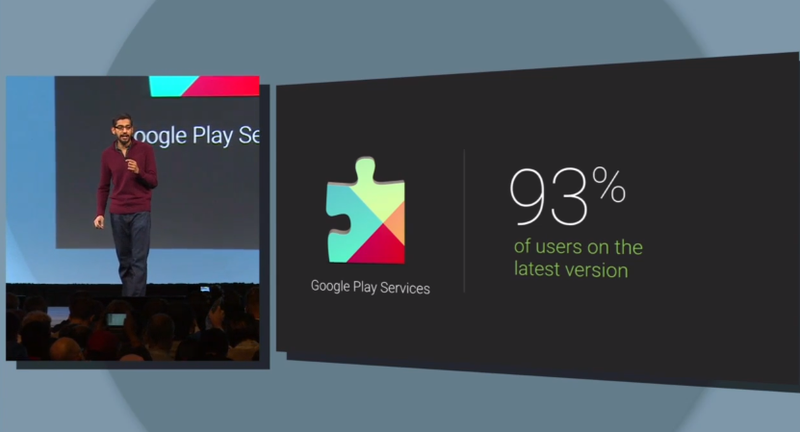 He also noted that 93% of Android users are on the latest version of Google Play Services which updates every six weeks. Pichai also announced features coming to Android “L” including a kill switch and universal privacy controls. Pichai noted that Google Play automatically scans applications for malware and security patches are being sent out through Play Services to distribute them every six weeks. With Android L, Google is launching Factory Reset Protection in case a device is stolen preventing it from being used. Android L will also include new universal data controls for privacy which is a centralized settings panel for location history information and more.